Yes, soccer is a thing that they take seriously some places. To that end, a British professor is urging women to have a plan in place in case their partners turn abusive after the inevitable England loss. For some women it may be a case of staying out with friends of family members on England game nights or arranging for their children to go to a friend's house for a sleepover," says Professor Paula Nicolson. "If that is not possible it is crucial that women have relevant phone numbers to hand, and should know where to get help. Simple things like knowing where your mobile phone and car keys are could make all the difference. Many women feel the stigma of domestic abuse so don't feel able to talk to friends or family about the situation. But if they can overcome these feelings it might be advisable to get their friends or family to call them to check up on them during or after a game." It's almost unfair to tie this to soccer, as there's nothing about the game specifically that lends itself to domestic abuse. Any event like this would likely show the same effect; mix an emotionally charged situation with all-but-encouraged binge drinking, and you're going to give abusive types all the triggers they need. And then there's the long-held belief that domestic violence in this country rises on Super Bowl Sunday, or even during any football game. That's been thoroughly debunked by the few journalists who actually looked at the statistics. So while it's never a bad idea to be aware, there's also the possibility of an academic taking advantage of the world's biggest news story to advance her own research. 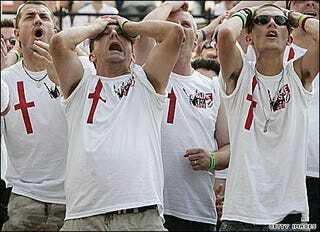 Of course, maybe England will win it all, and the drunken wifebeaters will have nothing to go psycho over, right? Yeah, no, maybe the women should heed Professor Nicolson's advice, just to be sure.